Did the Liberals learn nothing from Gillman? The State Government is on the back foot over a decision made behind closed doors to spend taxpayers’ money on a project that critics say is anti-competitive. The scenario is all-too familiar to South Australian voters, writes David Washington. An SMA image of the proposed Adelaide Oval Hotel, integrated with the stadium's eastern stand. Politicians of all hues seem hard-wired to behave in certain ways once they’re in power. One of those seemingly in-built behaviours is to make decisions about the spending of public money through opaque processes – and then get upset when those decisions are questioned publicly. It was this failure that caused the Weatherill Government so much grief in relation to Crown land at Gillman that it agreed to sell to a consortium – behind closed doors – without going to tender. While it was being beaten about the head by a Supreme Court judge, the Auditor-General and then the ICAC, the Labor administration sniffed the stinky breeze and came up with a procedure for assessing so-called “unsolicited bids” – ideas brought to Government by outside bodies in the hope of gaining some sort of taxpayer support, financial or otherwise. Anti-corruption commissioner Bruce Lander ultimately found in relation to Gillman that the process to approve the deal was “outcome-driven” and consequently “not as rigorous and independent as it should have been”, with two public servants deemed to have been involved in maladministration. The Liberals, one would hope, would have watched that disaster and heeded Lander’s findings, with a view to providing sharper public administration when it finally regained government. The Adelaide Oval hotel affair shows our new Cabinet may have learned very little. 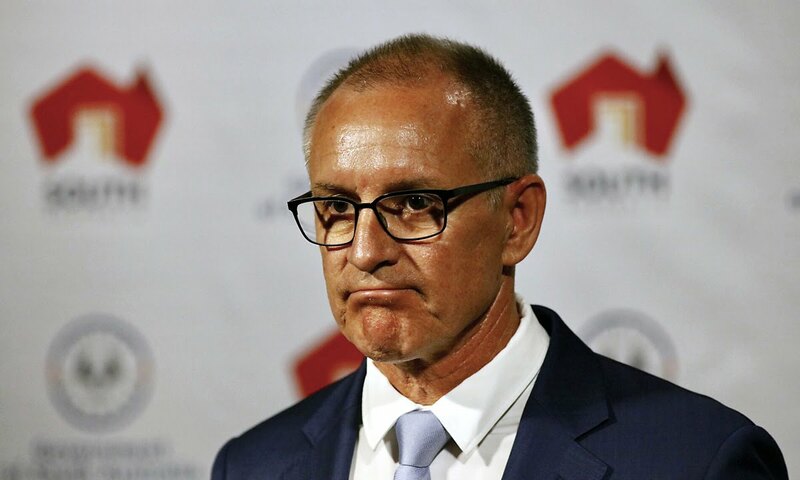 In fact, the rhetoric of some ministers and their disappointment at their Oval loan decision being questioned is redolent of Labor Premier Jay Weatherill’s weary exasperation at concern over Gillman. At first glance, Gillman and the oval hotel – as projects – have little in common, but this isn’t the central point. What is at stake here is confidence in Government decision-making processes when it chooses to spend public money on projects pitched behind closed doors by powerful interests. Gillman didn’t involve the expenditure of public money – what caused consternation was the fact that one consortium was given the option to purchase the Crown land, without exposing the price to competitive tension. The proposed Adelaide Oval hotel is benefitting from a State Government loan to the Stadium Management Authority of $42 million – a significant amount. The proposal, originally made behind closed doors from the SMA to the highest level of Government, was, like Gillman, kept hidden from the public until it appeared as a “drop” to the Murdoch press. 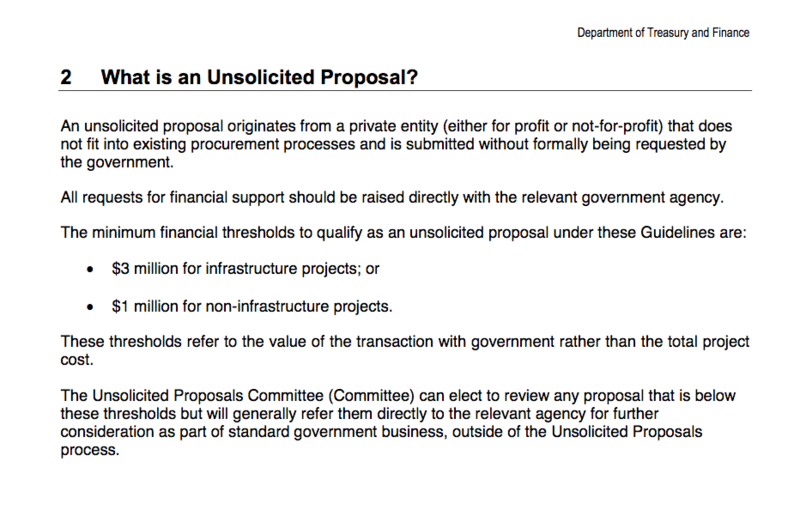 It was, unambiguously, an “unsolicited bid”, as defined by the Government’s guidelines (see below). Source: the State Government’s Unsolicited Proposal Guidelines. As such, it should have been assessed by the Department of Treasury and Finance’s Unsolicited Proposals Committee. It wasn’t. In the case of Gillman, the original proposal from Adelaide Capital Partners, which, remember, predated the guidelines, took some time to work through the system – largely because the board of Renewal SA, custodians of the Gillman land, stood in the way. The Government was very keen on the idea – but much of the board, not so (half of them ended up resigning in protest). In the case of Adelaide Oval, the Government acted with extraordinary speed – there was no pesky board to cause any troubles. Only weeks after the idea was revealed publicly, and less than two weeks after plans were lodged, the State Commission Assessment Panel had approved the project. Treasurer Rob Lucas seems surprised that anyone would question the Government’s willingness to lend millions of taxpayers’ money to the project over a generous 30-year term with minimal scrutiny. This is a highly reductionist view of the unsolicited bids process which, at its heart, is designed to ensure public money is spent wisely and in an open and transparent fashion (and if the Treasurer doesn’t like the current guidelines, he should write some new ones, rather than inventing new definitions on the fly). The fact is that there are groups out there – including hotel developers – that would love some taxpayers’ money to spend on their Adelaide projects including, like the Adelaide Oval hotel, on public land. Indeed, the previous State Government was in negotiations with the Marriott International hotel group to build a five-star hotel on the old RAH site. Likewise, a private concept for a hotel on parklands near the new RAH has been in the offing for years. It is conceivable, is it not, that one of these proposals – or something like it – might offer benefits to the community and the economy similar to, or exceeding that, of the Adelaide Oval hotel? It is also conceivable that public funding for a hotel on, for instance, the old Le Cornu site in North Adelaide might also be an attractive option for a taxpayer-funded loan. Remember, the previous State Government gave the city council $10 million to help purchase the land. As a community, we already have skin in that game, for better or worse. The council says it’s still going through an expressions of interest process for the Le Cornu site, but it is “mindful” of the potential impact of the oval hotel. Like Gillman, the oval hotel deal has sparked concern from commercial competitors. Some in the hotel industry can’t understand why the State Government would facilitate the SMA – a joint venture of the SACA and the SANFL – building a competitor, bolted onto an oval that has already cost the taxpayer more than half-a-billion dollars, and with benefits that other developers simply can’t access. Lord Mayor Sandy Verschoor made a similar point. “Let us not forget that this commercialisation has a distinct competitive advantage over other rate and taxpayer private parties investing in our city,” she said. “They (the SMA) do not pay council rates, which would be in the vicinity of $40,000 per year, and they’re not having to pay for the land, which would normally account for 20 to 25 per cent of the cost of a development. Another credible figure, economist Michael O’Neil, from the South Australian Centre for Economic Studies, is also worried – about process. He told InDaily this week the Government’s approach was “another example of poor public policy processes” – comparing the secrecy surrounding this decision directly to the Gillman case. “My interest in the whole saga is simply this: good process inevitably leads to good public policy outcomes and it is debatable whether good process has been followed in this case,” he said. Of course, it is possible – probably likely – that the unsolicited bids panel would have waved the Adelaide Oval hotel project through. But at least the process of handing out $42 million of taxpayers’ dollars would have been exposed to some scrutiny, other than the Cabinet club, before it was set in stone. What signal does this send to other well-connected bodies or businesses wanting to get their hands into the taxpayer cookie jar? I think we all know the answer to that question. And that’s no way to run a Government that wishes to retain the confidence of its electors. Dare I say it, the whole thing smacks of “announce and defend“. David Washington is editor of InDaily. Additional reporting by Stephanie Richards.